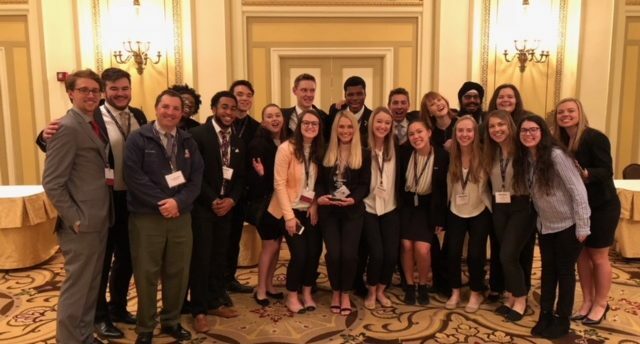 For the 13th year in a row the Belmont Enactus Team won its league at a regional competition, this year held in Chicago on April 9. With the win comes an automatic invitation for the team to compete in the U.S. National Exhibition, which will be held this year in Kansas City May 20-22. Belmont Enactus is led by Rachel Masterson, Emily West, Olivia Hosey, Lucas Wilson, and Mohansingh Udhwani. This year’s presenters are Chloe Bidne, Abby Menear, Mohansingh Udhwani, Nick Chakinis, Nick Bucher and Tito Ebiwonjubi. Enactus featured community partnerships include projects with Knowledge Academies, Sports Officials International and Senior Ride Nashville.